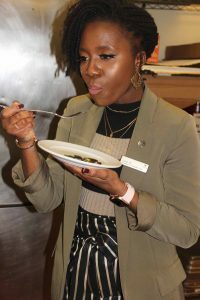 Juliet Wong, convention services manager at the Sheraton, samples one of the kelp dishes. After tasting rice pilaf with carrots, peppers and kelp, grilled shrimp wrapped in kelp leaves, baked salmon topped with leeks and kelp and manicotti stuffed with mushrooms and kelp, restaurant owner Chris Szewczyk is eager to incorporate the Connecticut-grown seaweed into his menu. “It’s an exciting product,” said Szewczyk, owner of Taino Smokehouse in Middletown. Standing nearby in the kitchen of the Sheraton Hartford South in Rocky Hill was Lydell Carter, sous-chef at the hotel restaurant. Between forkfuls of the various dishes, Carter said he, too, is a convert to the possibilities of cooking with kelp. Originally posted on the Connecticut Sea Grant website. Enjoy the healthful benefits of seafood, at least two meals a week. 1. Keep seafood cold* between store and home. Store immediately in refrigerator. 2. Use fresh fish within 1-2 days or wrap tightly and freeze immediately. 3. Thaw seafood overnight under refrigeration. 4. Keep raw seafood separate from cooked/ready-to-eat foods. Prevent raw/thawing seafood from dripping on other foods. 5. Refrigerate live (in shell) clams or oysters in shallow pan (no water). Cover with damp towel to maintain humidity. Use clams/mussels within 2-3 days and oysters within 7 days. Discard gaping shellfish that do not clamp shut when tapped. 6. Refrigerate shucked shellfish; use within 3 days. 7. Cook live lobsters or crabs the same day purchased. 8. Cook seafood to internal temperature of 145oF for 15 seconds (fish becomes opaque and flaky; shrimp/scallops turn firm and opaque). *Connecticut Sea Grant has insulated bags for $3 each. Call 860-408-9128. Before a bowl of clam chowder or a freshly grilled swordfish steak ends up on a restaurant diner’s plate, specially trained seafood handlers will have been working to eliminate any risk of contamination or hazards that could cause illness. 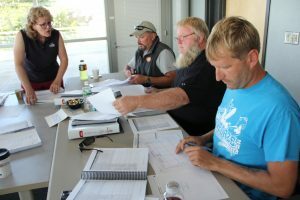 Many of those handlers will have learned their skills in training offered by Connecticut Sea Grant, including a three-day course held in September of 2017. The three days of training took place at the Avery Point campus of UConn. There, 22 seafood processors, wholesalers and dealers in products ranging from sushi to oysters to soups learned how to identify and control hazards associated with fish and shellfish to keep the public safe and their businesses running smoothly. Completion of the HACCP (Hazard Analysis and Critical Control Points) classes are required by a 1997 federal Food & Drug Administration (FDA) regulation. “Any wholesale seafood company has to have at least one HACCP-trained person,” said Nancy Balcom, associate director of Connecticut Sea Grant and co-teacher of the class with Lori Pivarnik, coordinator of food safety outreach and the food safety education program at the University of Rhode Island. While students in the recent class came from Connecticut, Rhode Island, Massachusetts and New York, previous classes have drawn from outside the Northeast. After completing the nationally standardized course developed by the Seafood HACCP Alliance of seafood scientists, regulators and industry members, students receive a certificate of training completion from the Association of Food and Drug Officials. They then go back to their workplaces to write site-specific plans for potential seafood safety hazards for the products they handle, applying HACCP principles, Balcom said. regulators each year, Balcom said she and Pivarnik have trained more than 2,000 individuals in the application of HACCP principles over the past 20 years. Sessions are offered alternately between Avery Point and URI in Narragansett. 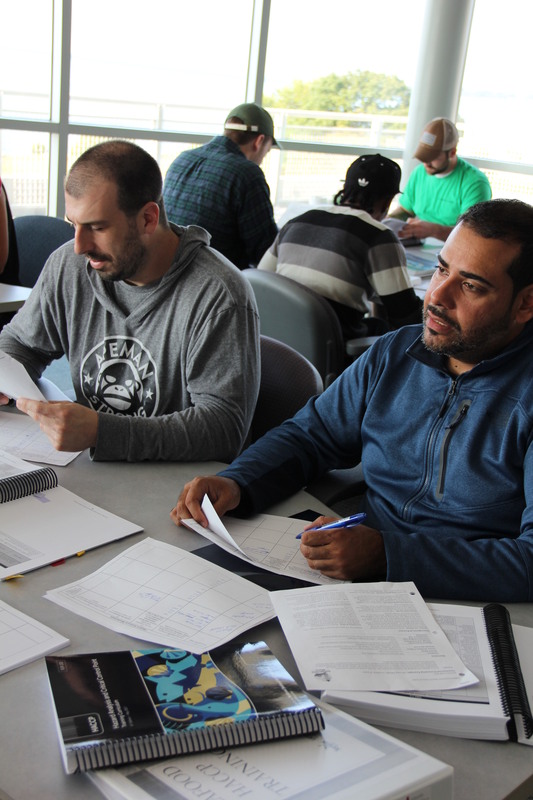 No exam is given to students at the end of the class, but they build experience developing plans for different seafood products as a group exercise to help them immediately apply what they learn once they return to their own businesses. That is in everyone’s best interest. “The test comes when the FDA comes in and inspects them,” Balcom said. Balcom and Pivarnik team up to teach the three day standardized class for industry and regulators, as well as a one-day practical course that, in combination with an online course offered through Cornell University, also meets the FDA training requirement. Since 1999, Balcom has offered eight equivalent HACCP training courses specifically for Connecticut shellfishermen under the auspices of the Interstate Shellfish Sanitation Conference—the only trainer to do so. 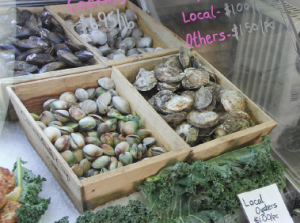 Connecticut’s shellfish harvesters are all licensed as seafood dealers, so they fall under the FDA HACCP regulation. 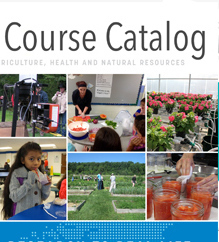 Finally, since 2001, as a School to Career offering, Balcom has taught the standardized industry course 13 times for senior high school students at The Sound School in New Haven, Lyman Hall High School in Wallingford, Bridgeport Regional Aquaculture Science and Technology Education Center (BRASTEC) and Grasso Tech in Groton, training 291 students who focus primarily on aquaculture. The newest group afforded that opportunity were the 17 students from Lyman Hall and Sound School who gathered at the New Haven campus over four days this spring. The HACCP certification training is part of the requirements for Sound School seniors taking the Shellfish Production course. Connecticut has an extensive agricultural industry that extends far beyond land. Hidden under its coast, lies more than 70,000 acres where one of the best protein sources is produced – shellfish (clams, oysters, mussels, and scallops). 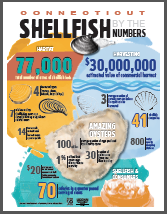 The shellfish aquaculture industry is over 150 years old and expanding in numbers of producers, and additional products. But shellfish are not the only crops that grow underwater. Seaweed, or sea vegetables, is a highly valued commodity at $8-10 billion in the global market. Seaweeds are consumed for their nutritional benefits and are a staple in Asian diets. Their components are in a wide range of products including fertilizers, animal feeds, nutritional supplements, cosmetics, and biofuels. Seaweeds also provide ecosystem services; they can be used to clean up waterways by extracting excess nutrients from urban runoff. Although the majority of production occurs in Asia, interest in seaweed production is increasing in the United States. For many years, seaweed has been harvested from the wild. However, the cultivation (or aquaculture) of domestic seaweed is increasing. Current producers of seaweed include shellfish producers and displaced lobstermen looking to diversify products and income. There is also an interest from municipalities who are looking at seaweed for ecosystem services. Currently in Connecticut, there are two types of seaweed cultivated and approved for food: the sugar kelp, Saccharina latissima and Gracilaria tikvahiae. The kelp grows in the winter season while the Gracilaria grows in the summer. There are four commercial farms growing sugar kelp. These farms are small-scale and mostly grow shellfish. 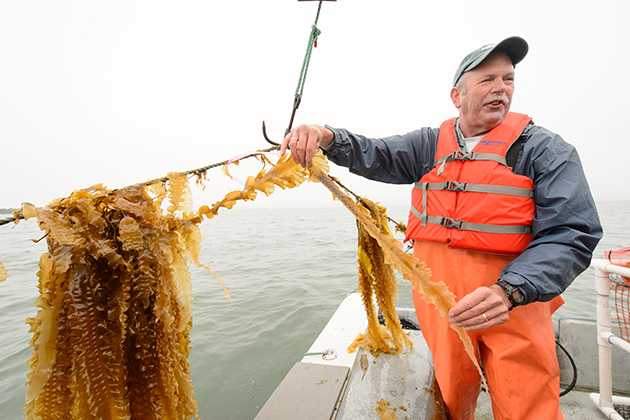 Connecticut Sea Grant has been involved in seaweed aquaculture for almost 30 years, funding extensive foundational and applied research of Dr. Charles Yarish in the Department of Ecology and Evolutionary Biology. More recently, Sea Grant and UConn Extension have been helping transfer aspects of the research to industry and market, along with Yarish and other collaborators. Sea Grant has been addressing several bottlenecks hindering further expansion of this new industry. The major bottleneck is lack of federal guidelines on the public health aspect of domestic seaweed production and processing. Since the majority of seaweed domestically produced is from wild-harvest, it has been unregulated. There are guidelines ensuring seafood, meat, dairy, and other agricultural commodities are safe for human consumption. However, we don’t have similar guidelines for cultivated seaweed. This presents a problem for state regulatory agencies that are trying to ensure the seaweed grown in Connecticut is safe. 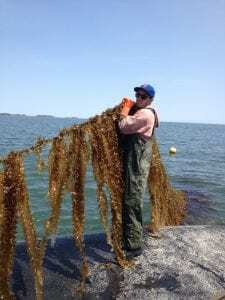 Sea Grant and UConn Extension partnered with the Connecticut Department of Agriculture’s Bureau of Aquaculture to develop guidelines that allow locally produced seaweed to be grown and sold in the state. This guide contains handling, storage, and processing guidelines for both species of seaweed grown in Connecticut. Seaweed can grow quickly and in large volumes, requiring harvesting be done all at once. Since seaweed has a short shelf life – it starts to degrade within hours, it must be used right away or processed into a form that will last. Local chefs desire raw kelp since it is fresh and unprocessed, but it has a very short shelf life. Kelp has also been processed into noodles and sold to a limited number of restaurants and retailers in the region. In 2013, Sea Grant assisted the Bureau of Aquaculture in approving the first commercial seaweed grower to sell fresh kelp and kelp noodles as food. This involved providing development funds testing the safety of both forms of kelp and seafood safety knowledge to determine appropriate handling, storage, and processing guidelines. The seaweed grower has now expanded to a large-scale commercial kelp processing facility in New Haven, Sea Greens Farms; that can accommodate seaweed produced by other growers in the region. Although guidelines have been developed for raw and kelp noodles, they have not been developed for dehydrated or dried seaweed. Sea Grant is working with a local food manufacturer to conduct drying experiments to determine if there are any potential hazards associated with dehydrating seaweed. Although experiments are ongoing, preliminary results indicate that as long as the seaweed is stored and handled properly, it should be safe to eat. Additional experiments are being conducted to determine if the summer seaweed, Gracilaria, is suitable for human consumption when cultivated in Connecticut’s coastal waterways. Gracilaria can remove heavy metals and other chemicals from the water, making it a great candidate for nutrient bioextraction to clean up waterways. However, there is no data showing that it is safe for human consumption. Currently, only Gracilaria cultivated in indoor tanks can be sold as food, since growing conditions can be controlled ensuring product safety. Experiments analyzing Gracilaria grown in Connecticut waters are underway to determine its feasibility as a food product. Additional barriers under investigation include expanding markets for local product and the successful transition of kelp seed-string production from research labs to commercial-scale. Although the production of seed-string has begun to shift into the hands of commercial seaweed operations, it is not fully independent and at the same level as the shellfish aquaculture industry. An extensive seafood marketing survey this summer will assess awareness and consumption of Connecticut seafood and seaweed among residents. Although the potential for seaweed aquaculture in Connecticut is huge, there are constraints to rapid expansion. The domestic seaweed aquaculture industry is still in its infancy and it is yet to be determined if it will become more than a niche commodity. Overcoming these constraints will take time, as with any new product. However, this new crop may contribute to sustaining and creating new jobs as well as providing additional ecosystem services for Connecticut’s coastline. Text 50555 the following: “UConn Extension (your name).” A $10 donation will then be made to the mGive Foundation to support the UConn Foundation. Charges will appear on your wireless bill. Please send your check to the following address, made payable to the University of Connecticut Foundation, Inc. Please include a note indicating the account name and number that you would like your donation to go to. NEWPORT, RI— Seaweed cultivation is a rapidly growing industry in New England, providing new economic opportunities for seaside communities and would-be sea vegetable farmers. The widespread efforts to improve the growth and marketing of seaweeds in the Northeast U.S. are receiving well-deserved recognition; On Oct. 13, 2016, three state Sea Grant Programs — Connecticut, Maine, and New Hampshire, jointly received the Sea Grant Association’s Research to Application Group Award for their work to advance seaweed aquaculture. The award, presented during the national Sea Grant Week conference in Newport, R.I., recognized the group effort titled “Northeast Sea Grant research paves the way for new sea vegetable aquaculture industry in New England.” Selected by a panel of judges from 17 total group nominations, this research has developed viable mass-scalable seaweed aquaculture for domestic markets. Outreach programs continue to expand these markets with active seaweed harvesters and diversified products. New processing methods and product forms are being evaluated and tested in all three states. Seed banks and nurseries were also established to assist growers. “The award recipients exemplify the strength and value of integrated research, outreach and education programs supported by the Sea Grant network, and clearly demonstrate the importance of translational research in supporting science‐based management” said Sylvain De Guise, president of the Sea Grant Association. For nearly 30 years, Sea Grant-sponsored researchers primarily in CT, NH and ME have investigated the basic physiology, genetics and growth of economically important seaweeds. This work served as the basis for recent research advancements in nursery and cultivation techniques and new applications. Native seaweeds are now grown for food and other products such as fertilizer. Early milestones included growing sugar kelp in culture through an entire life cycle. Through partnerships with Ocean Approved LLC (Portland, ME) and Bridgeport (CT) Regional Aquaculture Science and Technology Education Center, culture systems were piloted and seeded kelp was grown on longlines near Bangs Island (ME) and in Long Island Sound. Bioextractive properties of seaweeds to clean polluted waters were analyzed in NH, CT, and Bronx, NY with additional support from the U.S. EPA. CT and NH Sea Grant researchers also developed a free technical manual and training videos for the culture of four species of seaweed for human consumption, covering the biology, culture and cultivation systems for sugar kelp, Graciliaria, nori, and Chondrus crispus (Irish moss). CTSG extension staff partnered with CT state regulators to develop a permitting process for prospective kelp farmers. Workshops and public events have helped introduce businesses and the public to the benefits of seaweed as food and other products. Worldwide, seaweed production eclipses the production of cultured shellfish, finfish and other marine organisms, but U.S. production contributes only ~1%. This work will help to increase seaweed production, providing food and jobs. Seaweed cultivation also improves water quality in eutrophic urban coastal waters by removing nitrogen and phosphorus, which has been supported by both Sea Grant and the EPA Long Island Sound Study. Team members named in the award nomination: Drs. Charles Yarish and Jang Kim (UCONN and Connecticut Sea Grant), John Curtis (Bridgeport Regional Aquaculture Science and Technology Education Center), Drs. Nicholas Brown and Susan Brawley (Univ. of Maine), Sarah Redmond and Dana Morse (Maine Sea Grant Extension); Drs. Chris Neefus and Lindsay Green (Univ. of New Hampshire and NH Sea Grant), Amanda LaBelle (Island Institute), Anoushka Concepcion (Sea Grant and UConn Extension) and Peg Van Patten (Communicator, Connecticut Sea Grant). This year’s Hartford County-UConn Extension, Farm to Food Tour is going to sea! 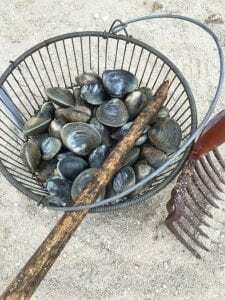 Extension’s partnership with Connecticut Sea Grant has opened the door to the mysteries of aquaculture and the “farmers” who produce Connecticut’s shellfish and other ocean grown products. A luxury coach will take us from our starting (and ending) point in Glastonbury to visit notable seafood producers on Connecticut’s shoreline. UConn Extension’s partnership with Connecticut Sea Grant has opened the door to the mysteries of aquaculture and the farmers who produce Connecticut’s shellfish ad other ocean grown products. Following a visit to a New Haven based kelp farmer, the UConn Avery Point campus will welcome us to their historic Branford House mansion. There we will enjoy a delicious seafood luncheon. But save room because afterwards we’ll be treated to a raw bar with oysters that are fresh out of the ocean. This experience will be hosted by a working shellfish cooperative in Noank, CT where we’ll learn about harvesting shellfish from the people who do it. After that we’ll travel to Bluff Point State Park to see a demonstration of clam digging, and we’ll be encouraged to roll up our pant legs and dig some ourselves. Send in your registration form right away–the bus fills up quickly. Registration deadline is August 31st. Questions can be directed to Martha at marthadan01@gmail.com. More details and registration are available at this website. Contact your friends and mark your calendars. This tour is sure to be very popular! Make plans to join us and learn how UConn Extension supports and celebrates Connecticut’s aquaculture and shellfish industry. 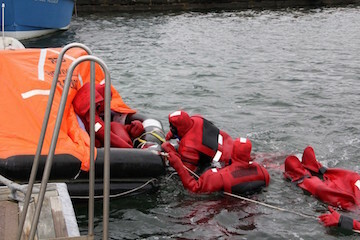 Fishermen practice climbing into the life raft from the water in their immersion suits. The strongest person enters first, to help the rest of the crew into the raft. Photo: Nancy Balcom. 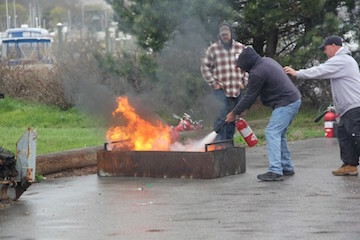 A fisherman practices fire suppression with a crew member providing backup. ; Trainer Jake Cabral from Fishing Partnership Support Services looks on. Photo: Nancy Balcom. 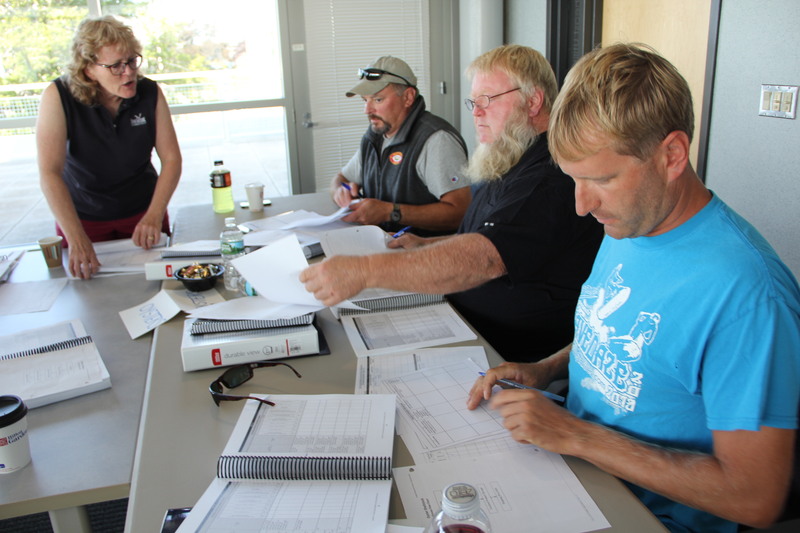 Nancy Balcom, Associate Director and Program Leader, Connecticut Sea Grant, and Senior Extension Educator, UConn Extension, organized and facilitated safety and survival training for 49 commercial fishermen. 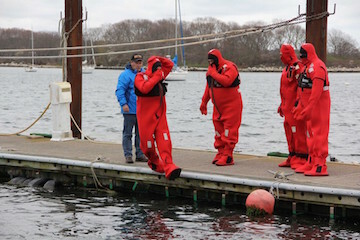 The training was sponsored by Connecticut Sea Grant, US Coast Guard, University of Connecticut and the Alaska Marine Safety Education Association on May 4, 2016 at the University of Connecticut – Avery Point. Drill instructor certification for 24 fishermen was conducted on May 5, 2016. Training was provided by Fishing Partnership Support Services (MA) and by Coast Guard F/V Examiners from New Haven CT and Coram (Long Island) NY.